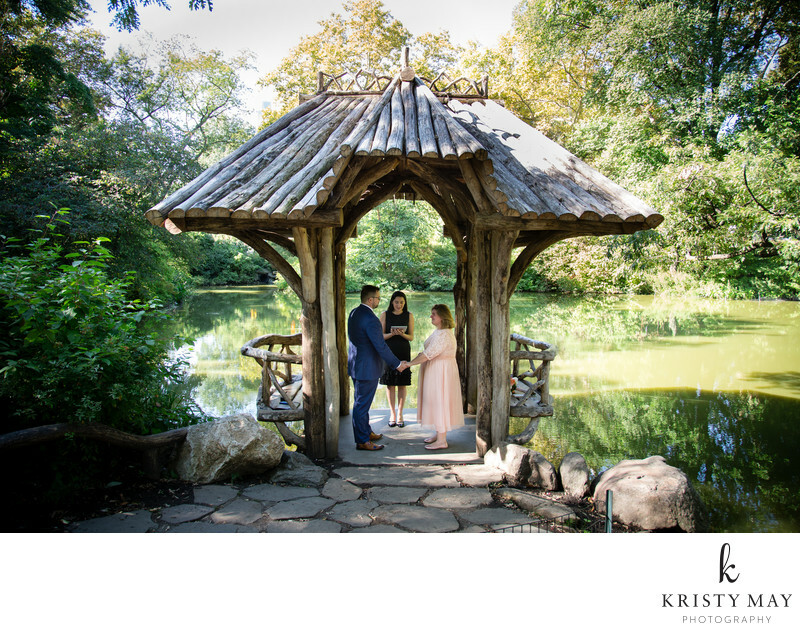 A guide to my favorite Central Park wedding and elopement ceremony locations complete with tips, lighting concerns and suggestions to help you decide which location may be best for your wedding. Please reach out if you have any questions. And if you'd like to see more photos or additional location suggestions, please contact me, I'm happy to help! 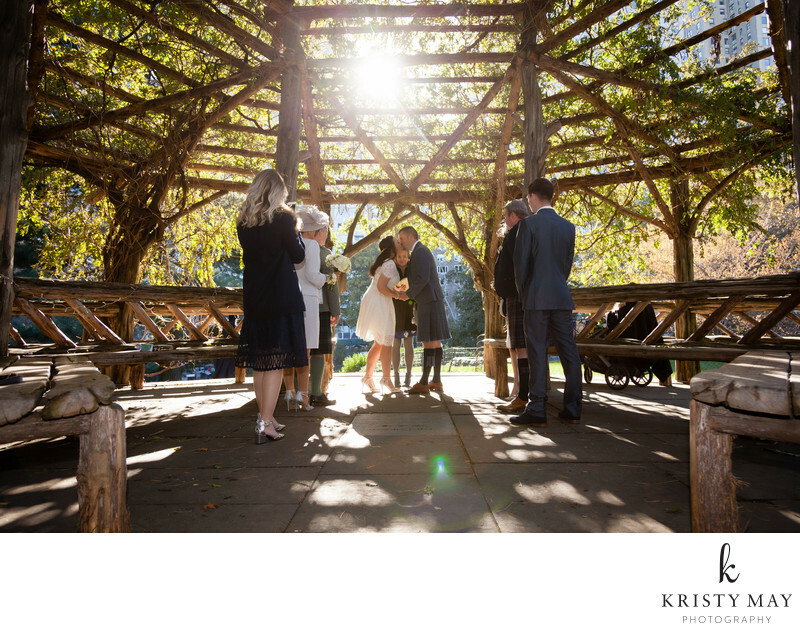 For additional info on permits and officiants for Central Park nuptials, visit this page. 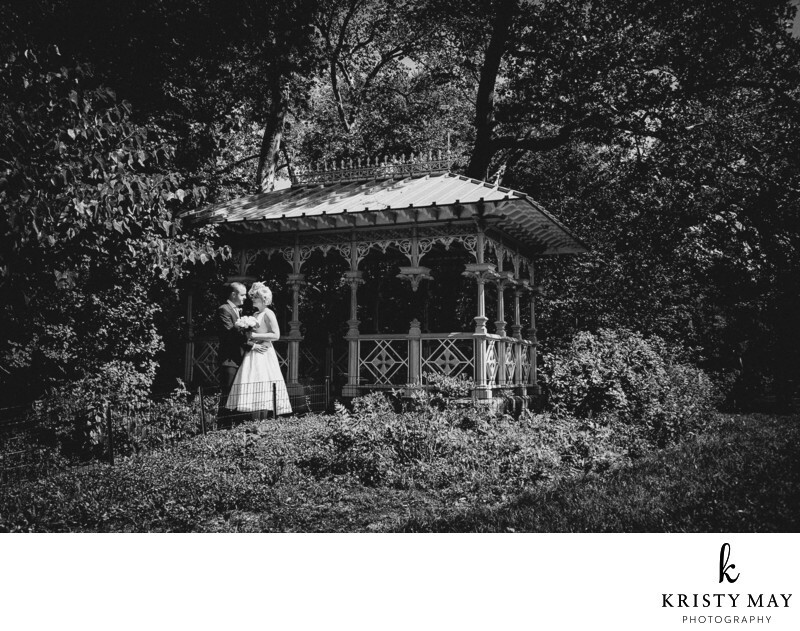 A bride and groom pose for a portrait following their ceremony at The Ladies Pavilion in Central Park. The Ladies Pavilion is an ornate cast iron Victorian shelter built in 1871 and moved to the current location in 1912. It is an ideal location for an intimate wedding or elopement given the cover it provides in case of rain. I will caution if you are seeking a private ceremony that the location is popular with tourists and parkgoers who like to climb on the rocks nearby and frequent the paths around the pavilion. I suggest a weekday morning ceremony for the least amount of traffic if that is a concern during the Spring-Fall. Condition: Well maintained with two benches. Birds will nest in the columns occasionally in the Spring for an added experience. Best time for a wedding: morning on a weekday for more privacy. Fun Fact: The inlet near the pavilion was originally used for “ladies only” ice skating. Eventually the ladies preferred skating with the men in the main section of the pond because it was the only time they could hold hands in public! That is where the name of the pavilion originated. The Bow Bridge is one the most iconic features of Central Park. The cast iron bridge was designed by Calvert Vaux and Jacob Wrey Mould in the Classical Greek style. It was completed in 1862 and is the longest bridge in the park. Boaters during the warm months travel under the bridge and the setting is quite picturesque. As a wedding ceremony location, it is not an especially private one given the traffic from pedestrians crossing it. For a small ceremony with an officiant, the couple and photographer, it is advisable to have a weekday morning ceremony when the park is less crowded Spring through Fall. There is another location nearby offering a view of the bridge I often suggest to couples where the bridge can be in the background. There is a bench and it is right on the pond. It isn’t totally private, as people from the bridge and boats will watch on nice days, but less traffic than on the bridge itself. I suggest this location for midday or later afternoon weddings or on overcast days preferably not the morning as it is totally in the shade and the bridge in the sun making it difficult to be seen in photographs without heavy flash usage. The Bow Bridge is named so because it is shaped like an archer's bow. 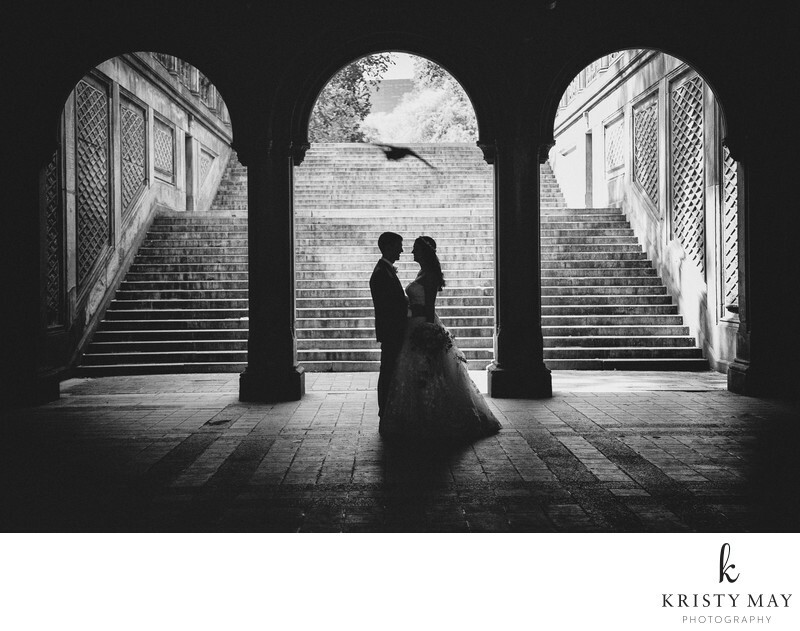 A wedding or elopement in Central Park would not be complete without a visit to the Bethesda Terrace and Fountain area. I often imagine clients returning to the spot we take photos in 20 or 30 years with their families to recreate it. The location is iconic for a reason and it is also popular. The wedding ceremonies I have done here have been as back-up when it rains mostly. I would usually suggest another spot for a smaller group unless you are prepared to get married super early (like 8 am) or don’t mind having a crowd watch your ceremony. That said, it is a great back-up location and excellent for taking wedding photos. Best time for a wedding: Early due to popularity of location. Typically not accessible during the first/second week in June due to a gala. Check the event calendar on Central Park Conservancy website for specific dates, but the area is inaccessible several days before and after for set-up. In addition to turtles and ducks, I also spotted a beautiful falcon one fine day sitting on the stone railing while photographing below. Another fun sighting at the terrace is the bubble men. Totally optional, but some clients like to experience this and if present, for a tip, we can take photos with the bubbles. The sculpture adorning the fountain, “The Angel of the Waters” (1873), seen in this image, was sculpted by Emma Strebbins. She was a lesbian feminist back in the mid 1800s which is pretty fascinating. Learn more about her here. A Fall wedding ceremony by Honeybreak Officiants at Wagner Cove in Central Park. Situated on a small inlet off The Lake, Wagner Cove is a small Rustic shelter with two benches and a working boat launch. It can accommodate an officiant and about 4 people for a ceremony. The area is quite secluded and offers a more private wedding ceremony option. The staircase leading down to the structure makes for a grand entrance option for the couple or bride. Birds, turtles and ducks frequent the area and provide a nature filled backdrop. I once saw a raccoon in the area as well! Fun Idea: What if guests rented boats at the Loeb Boathouse and paddled over to Wagner cove and watched the ceremony from the water? The bride could enter from the staircase and meet the groom, who arrives by boat (or reserve) and then they meet for a ceremony under the rustic structure. Then everyone could have a picnic on the lawn on the hill over looking the pond for a budget friendly option or lunch or dinner at the Boathouse. 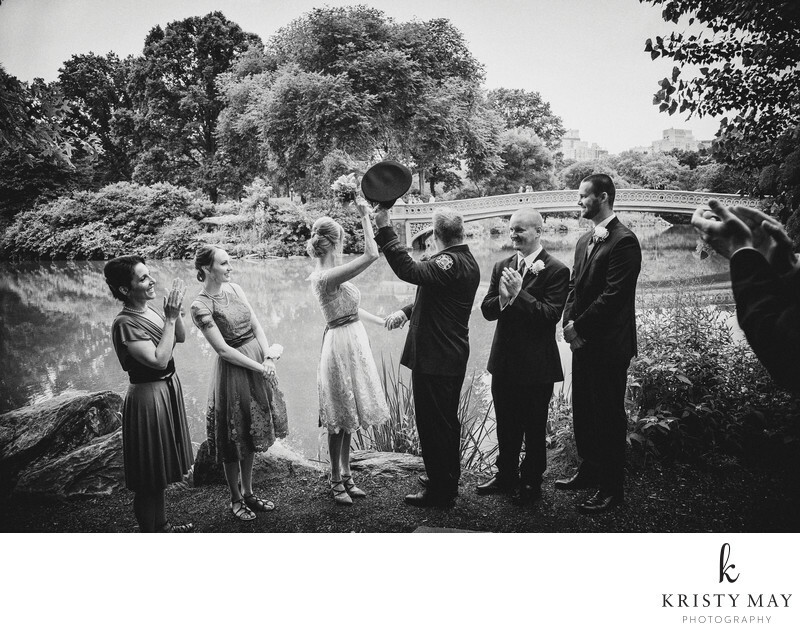 A wedding ceremony by Judie Guild at the Dene Summer House in Central Park. The Dene Summer House is a rustic structure overlooking the Dene Lawn near 5th Avenue and 67th Street in Central Park. It sits perched on a rocky hill and is covered with vines and foliage in the Spring through Summer. It offers a more private location for a wedding ceremony because park visitors can’t easily access it and will usually go around when they see a ceremony in progress. The only negative to this location is the structure itself. The beams create harsh shadows in the months when foliage isn’t present and where it doesn’t cover. I don’t suggest it during early Spring or Winter for this reason on a sunny day unless there ceremony were early in the day or later in the evening. Permit: I believe you can, not officially listed but can request? The Dene Summerhouse and adjoining landscape, the Dene Slope, a trail with a meadow, wildflowers and rustic seating, was designed to be a refuge from the busy city nearby. 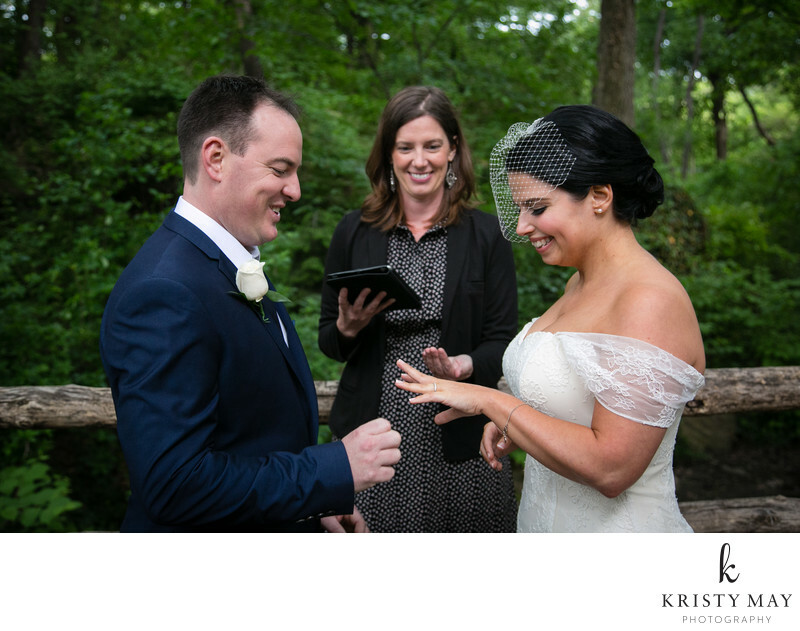 An intimate wedding ceremony by Officiant NY on a rustic bridge near the Stone Arch at 77th and Central Park West. There is a lovely rustic bridge near the Stone Arch at 77th Street. The path is frequented by walkers and others, but a short ceremony can be done there with minimal distraction. There is a small brook that flows underneath and foliage and trees surround. There are additional rustic bridges in the park that may work as well. 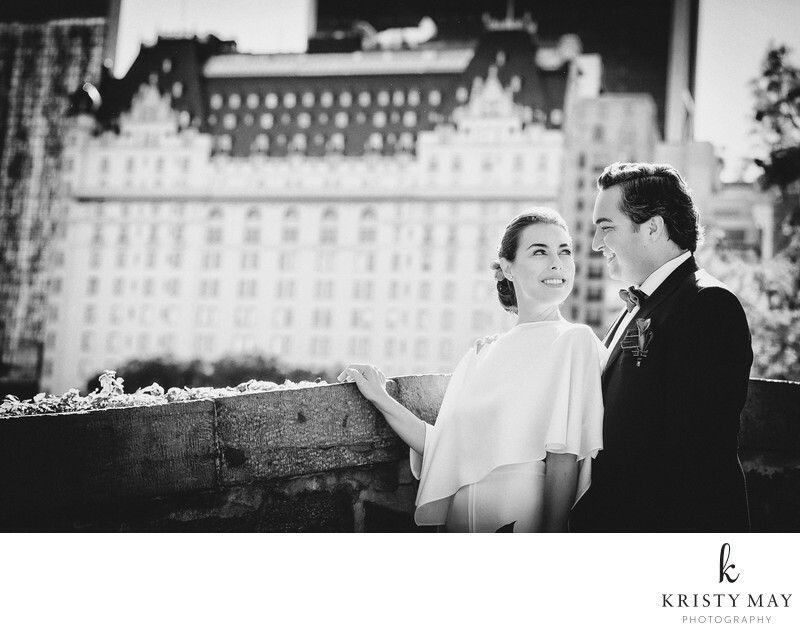 A wedding couple on the Gapstow Bridge overlooking The Plaza Hotel in Central Park. The Gapstow Bridge is the second most iconic bridge in the park after the Bow Bridge. It replaced another bridge on the same site in 1896 that had deteriorated. The stone structure offers a lovely view of The Plaza Hotel and the Southern end of the park overlooking The Pond and of the Wollman Rink in Winter and Victorian Gardens in the Summer. The bridge is a highly trafficked area and it also not wide. Ceremonies done early in the day and in Winter will be fine, however in the Spring- Fall it will be difficult to stop the flow of traffic for a distraction free ceremony. There is a spot that overlooks the bridge across The Pond for a small wedding that can work, but again, this is a very popular location so if privacy is a concern, this may not be the spot for you. However, earlier in the day usually the less traffic. Location in park: 59th St. Pond, off of Central Park West and 5th Ave. When the first and more ornate version of the bridge designed by Jacob Wrey Mould needed to be replaced after only 20 years, this incarnation was built with schist, which is a metamorphic rock. Clearly this time the designer was not messing around and thus over a century later it still stands. 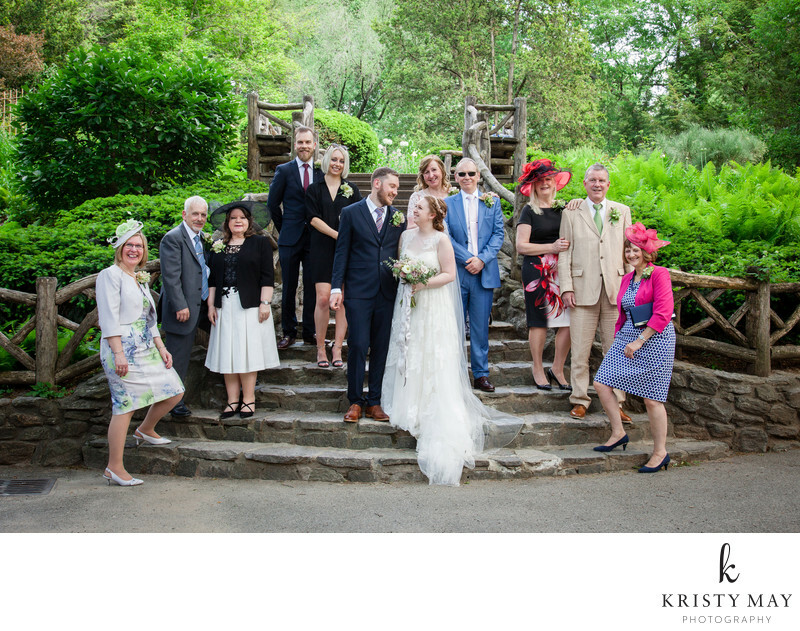 A wedding party portrait following a Spring ceremony on the rustic steps at the entrance to Shakespeare's Garden in Central Park. The Shakespeare Garden is a four-acre garden landscape featuring plants and flowers mentioned in the bard’s plays. The garden was a created in 1913 starting the a blackberry tree from Shakespeare’s hometown of Stratford on Avon. 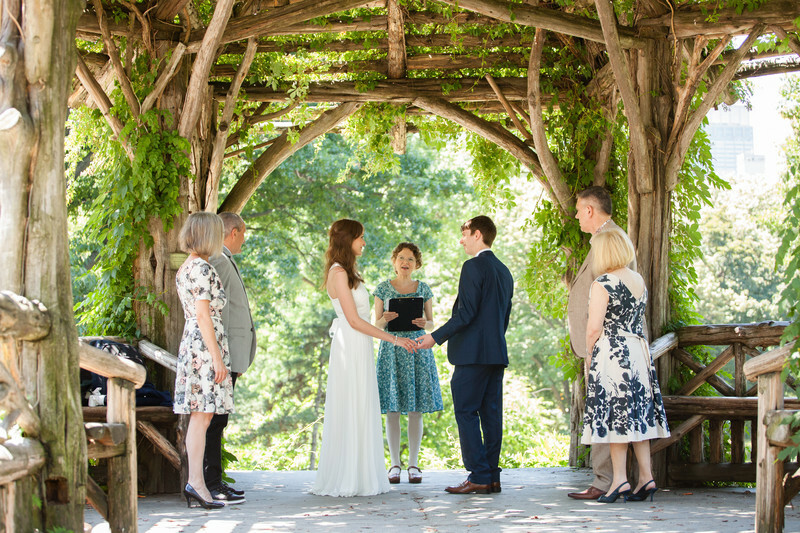 For weddings and elopements, the rustic wooden steps leading to the garden and a small overlook by the Charles B Stover Bench are popular locations for ceremonies. Tourists do frequent the garden but I find it to be less trafficked than others and I’m sure a private nook can be found for a small elopement. The garden is next to the Swedish Marionette Cottage, a delightful place to entertain children of all ages, as well as the Delacorte Theater which hosts Shakespeare in the Park each Summer. For more information on seeing Free Shakespeare in the Park, click here. The Conservatory Garden features a six acre formal garden with three distinct gardens, Italian, French, and English, around a large center lawn and allées. The center lawn features a grand fountain with a wisteria pergola behind it. The garden is popular with weddings and charges a more steep fee for ceremonies and photography than the rest of the park and is strict about the time and location you may use within it. However, those selecting the right time of year will be rewarded by the beautiful curated blossoms in their photos especially in Spring when the Cherry Blossoms and Crab Apples in the allees and wisteria pergola are blooming. There are some definite pros for having a wedding here, however given the location’s distance from the rest of the park (if you also want to photograph there), the price and depending on the time of year of your wedding, you may have just as lovely a ceremony elsewhere in Central Park. I’d consider it for a weekend, (bear in mind, there will also be other wedding parties there as well, as I learned they do give out several permits for a time slot) and go early in the day if possible during peak time. Best time for a wedding: Spring and Fall when flowers are peak blooming to get best value. Earlier in day would likely be better because gardens are still open to public. Weather: No Shelter. There are bathrooms on site. The Conservatory Garden is the only formal garden in Central Park and is also a designed quiet zone. 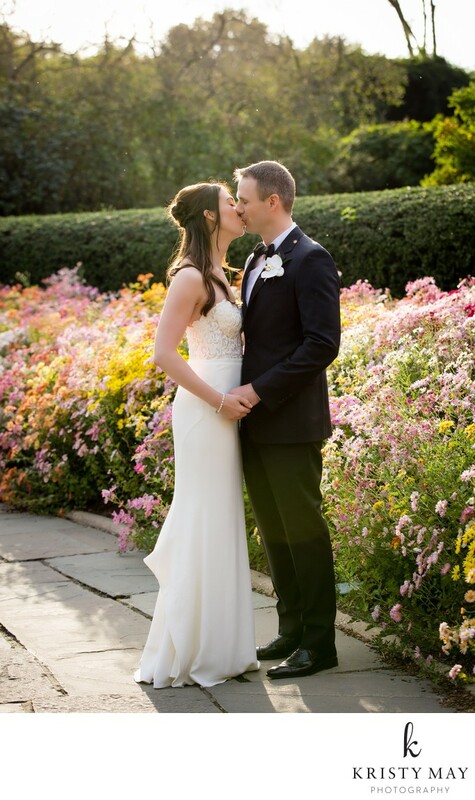 A kiss during a ceremony at the Cop Cot during a Fall wedding in Central Park. The Cop Cot is the largest rustic wooden shelter in Central Park and sits on a hill in its southern end. It is covered with flowering vines Spring-Fall and makes an excellent location for a medium sized wedding. The only caution I have about the location for related to lighting. Due to the construction, the beams can make hard shadows during mid day when the foliage isn’t covering the top of it. Also, given the proximity to the southern end and tall buildings in the park, I also caution with afternoon weddings in the early Spring, Late Fall and Winter due to the angle of the sun the building will also block the light on the structure, or part of it. Please consult your photographer for the ideal time of day for your wedding at that location as its unique structure and location can present lighting challenges. Size and Guest count: max. 50 ppl. 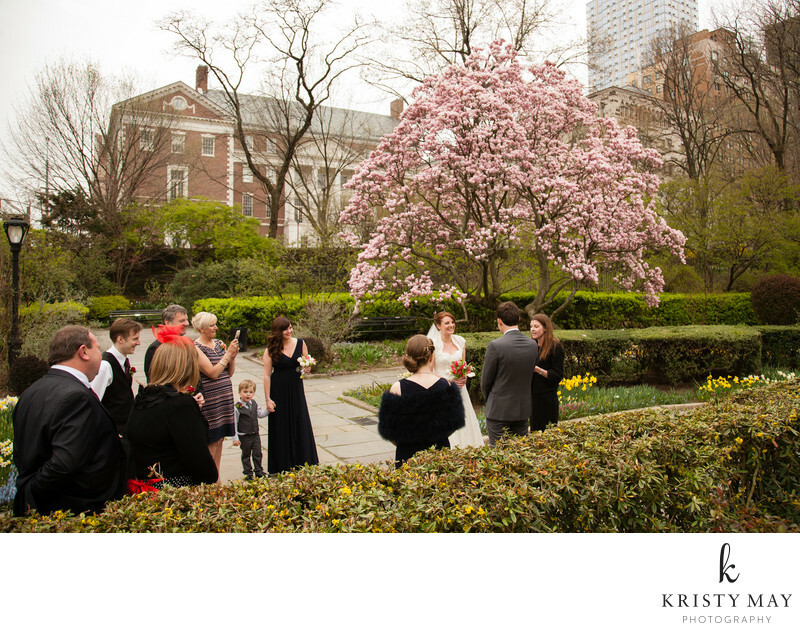 Best time for a wedding: Being on the South end of the park the building will block light sometimes during the year. Something to take into consideration for light. Traffic not much of a concern so time of day would be more of a light matter. Late morning to afternoon best bet, narrower window in winter then summer. Ask me! According to the Central Park Conservancy website, the name Cop Cot might mean “little cottage on the crest of the hill" in Scottish. Sounds fitting to me! Additional Images one and two.